Invite all your favorite Toluna friends and come and celebrate Toluna’s 10th birthday to receive some fantastic surprises! Toluna’s newest birthday game will celebrate our birthday and reward our most creative members with some surprises organized by the Product Testing team. 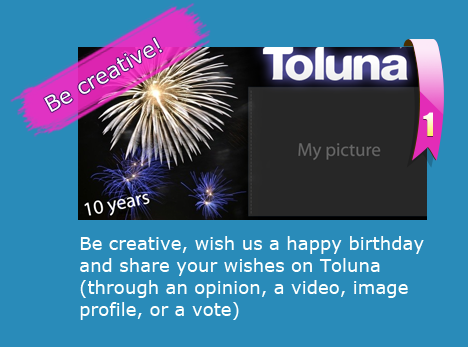 We’ve even included some great images in our album “Toluna’s 10th Anniversary” on our Facebook Page that you can use to help you get started! The member with the most creative birthday wish will have a secret surprise! Stay tuned for Step 2, Coming Soon!